Featuring one of the most radical bodyboard designs of the era, the Turbo Z was a board that was sure to turn heads! 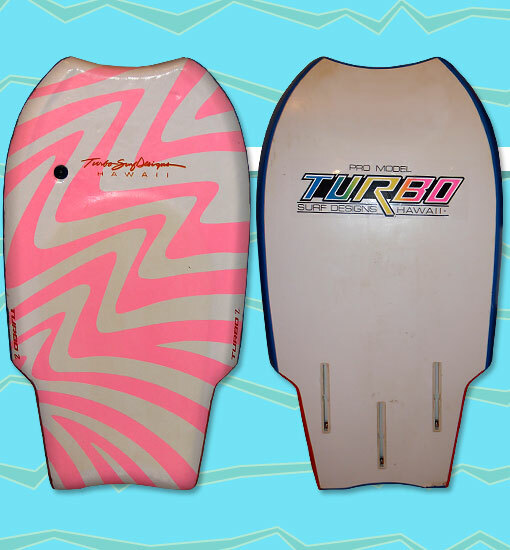 The vinyl deck, Arcel core, and PVC bottom were features common to most Turbo bodyboards, but the Z upped the ante with a hydroplane shape, scoop nose, wingers, a shorter length, foam padding on the deck for comfort, and three skeg boxes. Turbo kept their designs fresh by introducing all new graphics in 1988, including "Psychedelic" (shown here).